Will Smith was born on September 25, 1968 at 21:47 (09:47 pm) in Philadelphia, Pennsylvania/USA (39 N 57 /75 W 10) (source: AstroDatabank, Rodden Rating A). 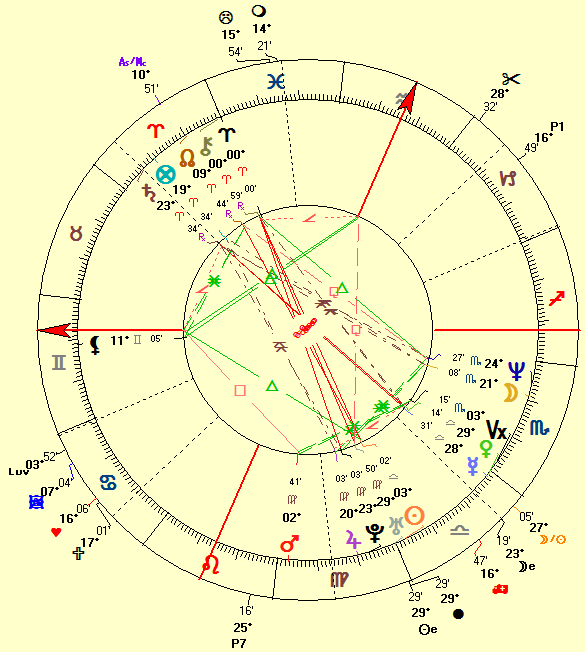 As usual we will look at the standouts in his natal chart. After all, that's what will bring us to the essence and disposition of the person. Not to overwhelm you with information, we will only assess the horoscope of Will Smith by looking at the factors that only have some meaning for his love life. There is quite a lot to tell about his natal chart though, but we'll still try to keep it to the essence. Venus and Uranus are at 29° in a sign, so-called "critical degrees"
An emphasis on the 2nd Quadrant implies that he may fear obligations and duties that may overwhelm him and/or make him dependent. The 2nd Quadrant especially has to do with the family life, suggesting he values his family life above all. Venus and Uranus at a "critical degree" (29°) indicate the urge to be a role model (Venus at 29° Libra) and taking a sobering look at his own needs (Uranus at 29° Virgo). Also, he is very creative and original in his work (Uranus at 29° Virgo), while also standing firm in his own shoes in matters of work (Venus at 29° Libra). In numerous cases, Venus at 29° Libra denotes a profound change in (love) relationships which manifested in his life by a divorce and 2nd marriage. Uranus at 29° Virgo too indicates starting over with someone new, confirming the likelihood of another marriage some time in his life. The stellium in Virgo emphasizes Virgo traits and points to analytic abilities and taking into account the minutest details. Virgo is a subordinate sign and it loves everything tiny and small. Virgo can be a workaholic, being always busy. The 5th house stellium points to creative self-expression, entertainment and having fun. He wants to shine and laugh. A stellium in the 5th house of love and children is most often found in the charts of people who have different children. The 6th house stellium suggests analytic abilities (and it reinforces the Virgo stellium traits). The 6th house is the house of servitude and because of the stellium that always emphasize the traits that accompany the house meanings, he can be submissive. This means that he may be a very good and loyal worker (confirmed by the Virgo stellium as well). He may love (small) animals as well. Neptune/Pluto because the ruler of the 8th house (mundane ruled by Pluto) is in the 12th house (mundane ruled by Neptune), Neptune is sextile and contra-parallel Pluto and Neptune is in Scorpio (ruled by Pluto). This is a chaotic connection and, together with the Sun/Uranus connection, it emphasizes the urge to be independent and not being pinned down. There can be issues with authorities (accepting them, for example). Sun/Uranus because Uranus is in the 5th house (mundane ruled by the Sun), the Sun is conjunct and contra-parallel Uranus. This analogy indicates the need to learn to manifest oneself, even though this may be in an original or even eccentric way. It's a very nervous connection that points to restlessness and also to the need to be independent. This connection cannot stand to be pinned down. Mercury/Venus because the ruler of the 2nd house (mundane ruled by Venus) is in the 6th house (mundane ruled by Mercury), Mercury is conjunct Venus, Venus is in the 6th house (mundane ruled by Mercury) and Mercury is in Libra (mundane ruled by Venus). This is the connection related to "the beautiful voice", someone who is able to talk in a diplomatic way and is able to express himself nicely or persuade others. Often, this connection shows a superficial and very peace-loving nature that does not stand conflicts. It is related to keeping up an outer appearance, a facade of harmony as if everything is nice and beautiful even though, on an inner level, things are NOT okay at all. The Ascendant at 7° Gemini indicates a youthful appearance and reflects a popular person. He absolutely needs a partner and relationships to be meaningful and shine. He is sociable and wants to be admired and "loved" (even though admiration and love are often mixed up). Interestingly, more than 70% of all people born with the double signs Gemini or Sagittarius on the Ascendant-Descendant axis of relationships, are divorced and/or are married different times. Gemini Ascendants need different (diverse) partners to experience life and develop themselves properly. This applies to Will Smith too. Venus as the final dispositor in his chart shows a compliant and conciliatory character or nature. He cannot stand disharmony nor conflicts and tries to appear sympathetic. Will Smith needs a beautiful environment with some comfort. Venus is one of the most powerful planets in his chart, not only because it's the final dispositor but also because it is conjunct Mercury, his Ascendant ruler. All planets conjunct the Ascendant ruler are extremely important because they tell something about one's drives, primal urges and instinct. In the natal chart of Will Smith, the position of Venus implies the need to please, being gentle and showing a soft and charming side. Saturn is the handle planet of a Sling configuration which suggests a defensive nature, someone you cannot get close to and who is suspicious. He wants power, on his own terms, and he can be very goal-driven. Saturn as the apex planet of a YOD configuration that incorporates Neptune and Pluto (as well as Jupiter) implies anxiety in his struggle to satisfy his safety urges and being out-of-tune with his ability to structure and define his own identity while growing up. He may have felt inadequate, insignificant and the more he gets mature, gets self-discipline and fortitude he may undergo a major alteration that evolves into responsibility and attaining a significant and well-respected social position. He should beware of dark moods though. Will Smith married Sheree Zampino (born November 16, 1967 in New York/USA) on May 9, 1992. They had one son, Willard Carroll "Trey" Smith III (born on November 11, 1992), and divorced on December 10, 1995. Will Smith married actress Jada Koren Pinkett (born September 18, 1971 in Baltimore, Maryland/USA) on December 31, 1997. Reportedly, Jada Pinkett Smith was crying on her and Will Smith's wedding day because she "never wanted to be married." For her, it had been a horrible and unpleasant wedding. Her mother pressured her to have a wedding ceremony rather than have a child out of wedlock. Will Smith, on the other hand, reportedly said he'd had the opposite reaction and couldn't have been happier to marry Pinkett Smith. Together they have two children: son Jaden Christopher Syre Smith (born July 8, 1998) and daughter Willow Camille Reign Smith (born October 31, 2000). The pair now refer to each other as life partners not husband and wife because they realize they are literally with somebody for the rest of their life. Reportedly, they disciplined themselves to only talk about their feelings once they had calmed down and could have a peaceful conversation about what was bothering them. They didn't use profanity with each other for 20+ years. The "problem" with the annual analyses generated by Astrodamus is that this software makes use of the primary directions which are stunningly accurate ON CONDITION that the time of birth is EXACT. A difference of 4 minutes brings worthless predictions! We did not rectify his natal chart though but we suspect his time of birth is quite accurate. What has Astrodamus to tell us about his future (love) life? Click here to download his Astrodamus predictions till 2050.